Grilled cheese sandwich requires just three basic ingredients, but it is one of the most popular comfort foods in the world. Celebrate National Grilled Cheese Sandwich Day on April 12 and don't forget to make your favorite sandwiches for breakfast. Grilled cheese sandwich appeared in the USA in 1920s, when expensive cheese and bread slices became available. The very first grilled cheese sandwich was served as an open-face sandwich, but eventually it evolved into what we know today. Grilled cheese sandwich can be served with bacon and tomatoes, that makes the meal much more filling. They also go well with tomato soup, that is a southern delicacy. 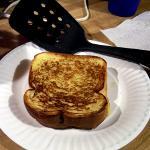 If you want to make perfect grilled cheese sandwich, use only fresh butter. The flavor of butter is very important for sandwich. Never grease pan with butter, put it only on the outer side of bread. Butter will be evenly distributed, that ensures golden crisp. If you want cheese to melt faster, don't cut it, but use grated or shredded. And don't forget to press sandwich with spatula after flipping. This will help melted cheese to spread among bread slices evenly.